Karen Raber is Professor of English. She specializes in Renaissance literature with emphasis on ecostudies, animal studies, and posthumanist theory. 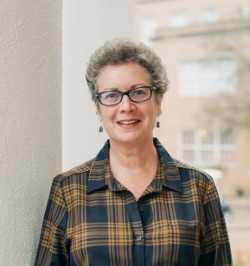 She joined the faculty of the University of Mississippi in 1995, after taking her BA from Yale University and her PhD from the University of California, San Diego. Her publications include three monographs: Shakespeare and Posthumanist Theory (Bloomsbury 2018), Animal Bodies, Renaissance Culture (U Penn 2013, a finalist for the 2015 ASLE Book Award), and Dramatic Difference: Gender, Class and Genre in the Early Modern Closet Drama (Delaware, 2001). She is also coeditor with Monica Mattfeld of Performing Animals: History, Agency, Theater (Penn State, 2017); with Ivo Kamps and Tom Hallock of Early Modern Ecostudies: From Shakespeare to the Florentine Codex (Palgrave 2009); with Treva Tucker of The Culture of the Horse: Status, Discipline and Identity in the Early Modern World (Palgrave 2005); and with Ivo Kamps of William Shakespeare’s Measure for Measure: Texts and Contexts (Bedford 2004). She is also editor of Routledge’s series Perspectives on the Non-Human in Literature and Culture. In 2014 she was awarded the University’s Faculty Achievement Award. Her current monograph-in-progress uses new materialist methods to investigate the nature of meat in early modern culture; other ongoing projects include the Arden Dictionary of Shakespeare and Animals, and Routledge’s Handbook of Shakespeare and Animals, which she is co-editing with Holly Dugan. When not writing, researching or teaching, she can usually be found riding or competing her two horses in dressage and hanging out with Doug McPherson and other human and non-human animal friends. Animal Bodies, Renaissance Culture. Philadelphia, PA: University of Pennsylvania Press, 2013. Ed., and Intro., Early Modern Ecostudies: From Shakespeare to the Florentine Codex, with Tom Hallock and Ivo Kamps. New York: Palgrave, 2009. Ed. The Culture of the Horse: Status, Discipline, and Identity in the Early Modern World, with Treva Tucker. New York: Palgrave Press, 2005. Ed. William Shakespeare’s Measure for Measure: Texts and Contexts, with Ivo Kamps. New York: Bedford/St. Martin’s Press, 2004. Dramatic Difference: Gender, Class and Genre in the Early Modern Closet Drama. Delaware: Univ. of Delaware Press, 2001. “Chains of Pearls: Gender, Property, Identity,” in Ornamentalizing the Renaissance, ed. Bella Mirabella (University of Michigan Press, 2011): 159-180. “Vermin and Parasites: Shakespeare’s Animal Architectures,” in “Ecocritical Shakespeare,” ed. Linda Bruckner and Daniel Brayton, (Burlington, VT: Ashgate Press, 2011): 13-32. “How to do things with Animals: Thoughts on/with the Early Modern Cat,” in Early Modern Ecostudies: From Shakespeare to the Florentine Codex, ed. Tom Hallock, Ivo Kamps, and Karen Raber (New York: Palgrave, 2009): 93-114. “From Sheep to Meat, From Pets to People: Animal Domestication 1600-1800” in A Cultural History of Animals, Vol. IV: 1600-1800, ed. Matthew Senior, (London: Berg, 2007): 73-99. “Recent Ecostudies in Tudor and Stuart Literature,” ELR 37:1 (Winter 2007): 151-71.